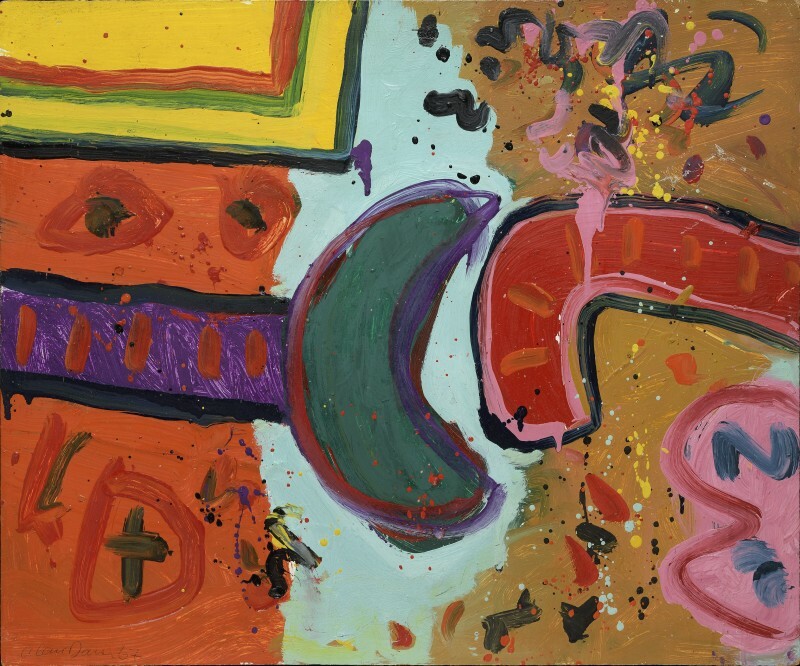 Born in Grangemouth, in 1920, Alan Davie studied at Edinburgh College of Art from 1937-40. Whilst studying, he was awarded a travelling scholarship, but had to postpone his voyage after the outbreak of war and conscription into the Royal Artillery. After demobilisation, he returned to life in Edinburgh, playing tenor saxophone in the Tommy Sampson Orchestra, and marrying Janet Gaul (an artist-potter) in 1947. Their honeymoon in Italy was funded by Davie’s travelling scholarship, and the beauty of the 13th and 14th Century art that he saw there was transformative. It was also here that he met Peggy Guggenheim (who purchased one of his works), and, in Venice and London, became influenced by contemporary painters such as Pablo Picasso, Jackson Pollock, and Paul Klee. He took inspiration from Modernism, but sought to explode its serious, academic, English form. Moving to London in 1949, he made money by making jewellery and playing the saxophone. In that year he met the Gimpel brothers, and, in the following year, they gave him a show at Gimpel Fils (although it would take him seven years to sell a painting at their gallery). In 1953 he took up a three year post at the Central School of Arts and Crafts, with an interest in Pacific and African art. He begun to realise that the work that he admired needed serious thought behind it—that these paintings should be saying something. In 1956, Davie moved to New York, where he met and saw the work of the Abstract Expressionists, and had a sell-out show—MoMA bought one of his paintings. In this year he took up a Gregory fellowship at Leeds University. A show at the Wakefield City Art Gallery transferred to the Whitechapel in 1958, launching his career alongside that of his fellow Scotsman, William Gear, and influencing a young David Hockney. Davie’s interest in Zen Buddhism permeated his art as well as his lifestyle—he wore a long beard and eccentric cloaks, fitting in well to the 1960s counterculture. His paintings appeared in the film Blow-Up (1966), and he borrowed, fashionably, from other mystical religions and cultures. His bright, almost kaleidoscopic paintings came from his unconscious, and were painted semi-automatically. The 1970s saw Davie fade from view, despite his being awarded a CBE in 1972, and retrospectives in both the UK and USA, at major institutions such as the Barbican. Between 1974 and 1991 Davie travelled to St Lucia, which became his home for half of the year, as well as a major inspiration. He became a Senior Royal Academician in 2012, and had exhibitions at the Tate in both 2003 and 2014. He died in 2014, leaving a dense and vital body of work. He remains an inspiration, a radical Modernist and shamanistic presence in the art world.